I will be traveling for two weeks from June 3rd to 17th so I have prepared the next several weekly Hilo peace vigil leaflets in advance. If at all possible please join the Friday peace vigil in Hilo or one in your community wherever that may be. Let us stand in solidarity for justice and peace around the world. Do Some Soldiers Enjoy Killing? Do some soldiers enjoy killing? If so, why? This question is thrust upon us by the recently released video of U.S. Apache helicopter pilots shooting a Reuters cameraman and his driver in Baghdad in 2007. Mistaking the camera of the Reuters reporter for a weapon, the pilots machine-gunned the reporter and driver and other nearby people. The most chilling aspect of the video, which was made public by Wikileaks, is the chatter between two pilots, whose names have not been released. As Elizabeth Bumiller of The New York Times put it, the soldiers “revel in their kill.” “Look at those dead bastards,” one pilot says. “Nice,” the other replies. Critics have challenged Marshall’s claims, but the U.S. military took them so seriously that it revamped its training to boost firing rates in subsequent wars, according to Dave Grossman, a former U.S. Army Lieutenant Colonel and professor of psychology at West Point. In his 1995 book On Killing, Grossman argues that Marshall’s results have been corroborated by reports from World War I, the American Civil War, the Napoleonic wars and other conflicts. “The singular lack of enthusiasm for killing one’s fellow man has existed throughout military history,” Grossman asserts. Rescue the Troops from War! Bring them Home Now! What is going to happen and how it came to pass that we weren’t forewarnded? Look at this graph. It does not come from Earth First. It does not come from the Sierra Club. It was not drawn by Socialists or Nazis or Osama Bin Laden or anyone from Goldman-Sachs. If you are a Republican Tea-Partier, rest assured it does not come from a progressive Democrat. And vice versa. It was drawn by the United States Department of Energy, and the United States military’s Joint Forces Command concurs with the overall picture. 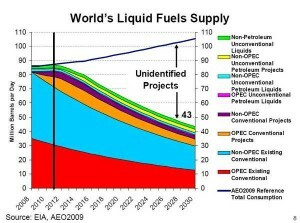 We are rapidly going to have to deal with less and less oil, since there has been no forewarning and no planning. It is a time for communities to prepare for community energy independence, because only that way will be safe. This means relying on the sun and wind and water that have always been with us. It means cooperation with each other to get through seriously difficult times. It means finding altenatives to oil throughout our lives as quickly as possible – the oil that runs our cars, the oil that heats our houses, the oil that runs generators for our electricity, the oil from which chemical fertilizers and insecticides and plastics and polyester are made, the oil that brings countless manufactured goods to us from overseas, the oil on which farmers depend for irrigation pumps, for transporting produce to market, for working the soil to bring us food. If you believe the graph, it will almost all be gone in 20 years. And the progressives and Tea-Partyers must remember that the people who brought this calamity to us are not our friends but are people we trusted and they trusted, so we must work together to cope with the mess that is upon us, and “to throw the rascals out.”. No more Wars! Solar, Wind & Water Power Now!